Fruits. Let’s be honest about how much we consume and throw away. 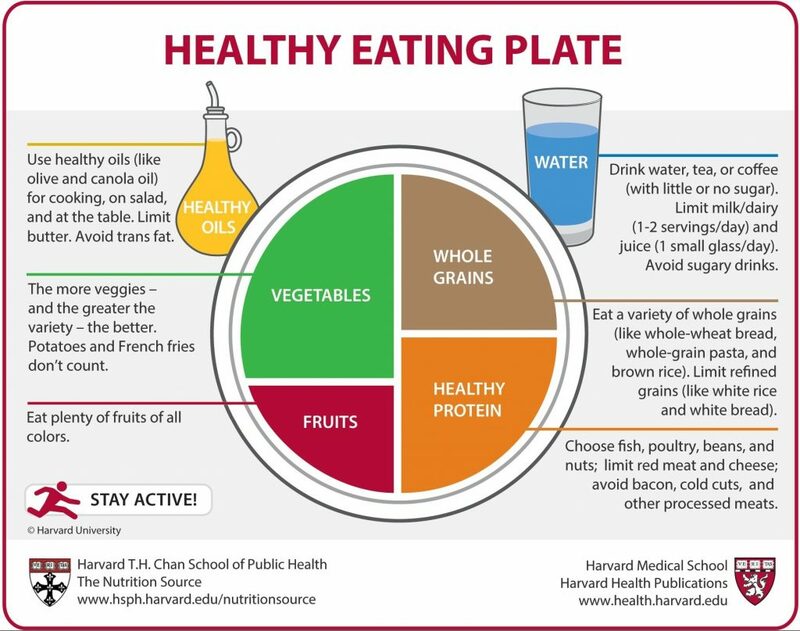 A healthy plate should have whole grains, proteins, fruits and vegetables with good amount of water and healthy fats for satiety. But do we really follow such public health recommendations? Image from T H Chan School of Public Health, Harvard University. I try to but in all honesty days when all six of these things make it into one single meal are rare. And as a result there are times when a lot of fruit- apples most often- passes it prime, gets soft and mushy only to be thrown away. Waste that makes me really sad although its impact on my behaviour is limited. 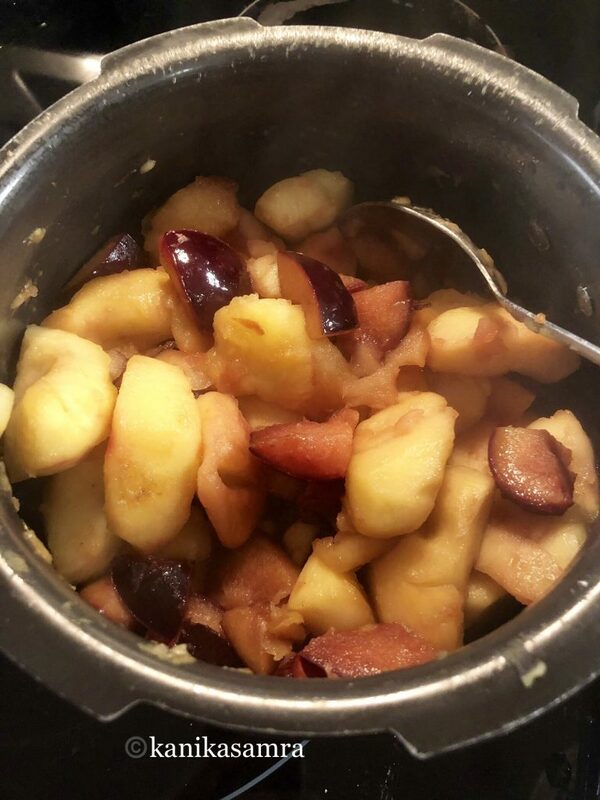 To lift the burden of guilt off my conscience, otherwise careful and nifty with inorganic waste, I salvage overripe fruit to make preserves and compote. As you can see below – something rotten is going on. And no, I did not cook with that apple. Instead sorting through my horde of fruit, I chose those that were not impacted by fungi. Makes about a pound and a half i.e 600-700 grams of compote. Prep time- 15 minutes, cooking time- 20 minutes. The first step is to collect all your ripe and over ripe fruit. Applicable to almost any fruit is the examination of its skin and pulp for softness, bruises and changes in color. Then wash all fruit. Peel apples and slice them into large pieces. I used plums and apples. 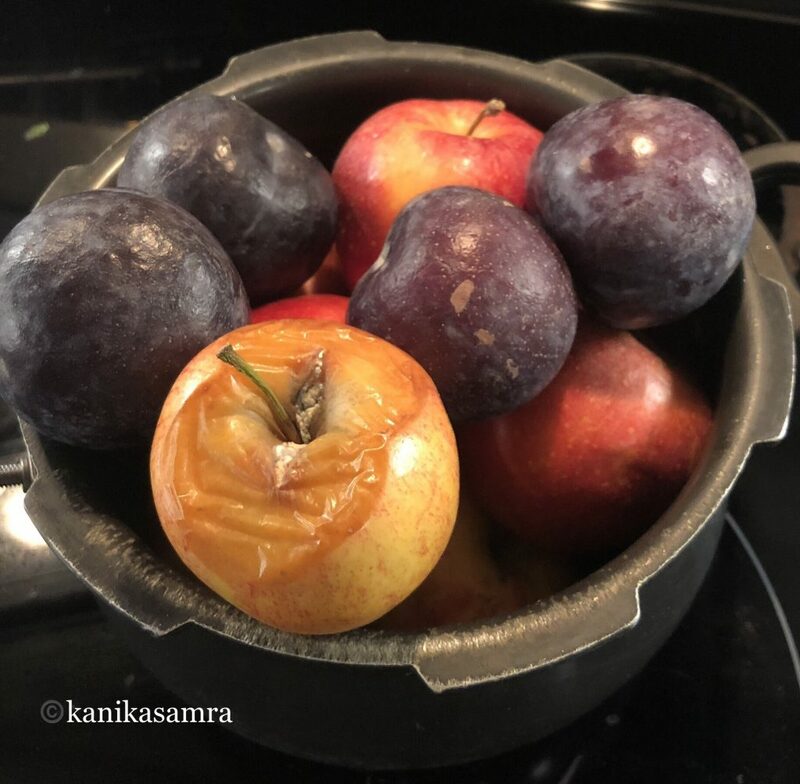 Plums can be used without peeling, their skin is really soft and becomes even easier to bite into once cooked. Open up plums and remove the pit. Also take off thin slices of flesh from the center abutting the pit. This tends to be slightly bitter. 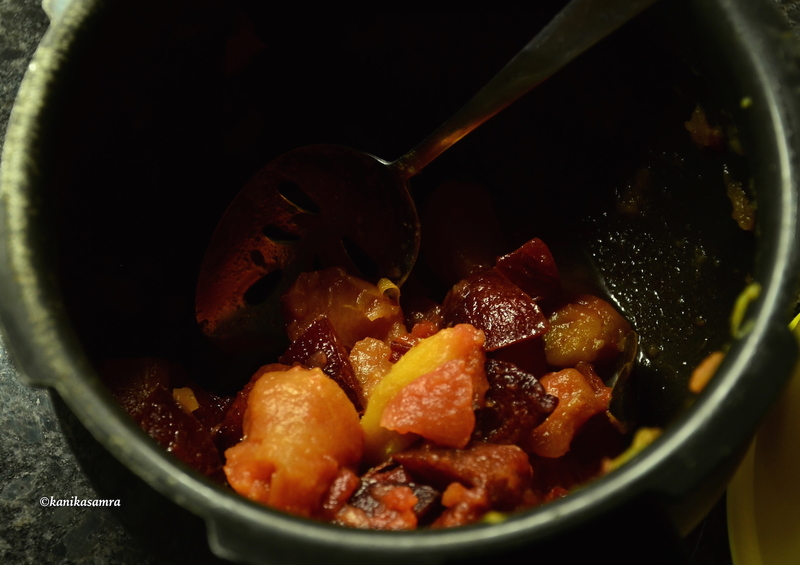 After all the fruits chopped, put a heavy bottomed pan or deep pot on the stove. Warm it on medium high heat. Then add a tablespoon of oil or unsalted butter. 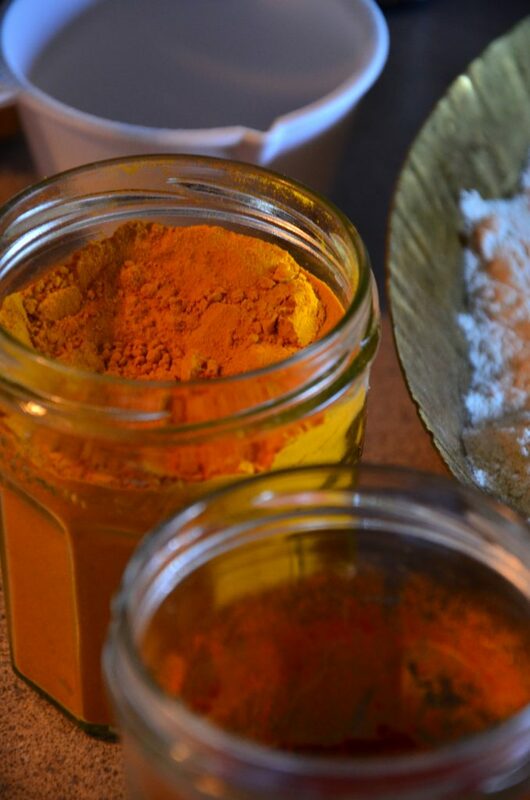 To this add whole spices- cinnamon, cloves and bay leaves. Saute them for a minute and then add fruit. Brown fruit on medium high for a few minutes. Keep stirring and mixing to avoid charring. Lower heat and cook covered covered for 10-15 minutes. I chose not to add any sugar or sweetners. Depending on your sweet tooth, you could add a few tablespoons of sugar or honey or agave- any sweetening agent of your choice. 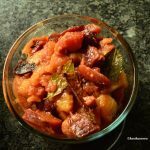 Since each fruit that I used is high in water content, there was no need to add additional water. Allow this to cool and then transfer to a a clean glass container with a lid, preferably air tight. This can keep for a week. I haven’t tried freezing it but if you do, please share your experience. Use it as a warm topping with ice creams, cold side with fresh pancakes and waffles or as a filling in pies and crumbles. Fruits can often go bad, and lets be honest that happens a lot. 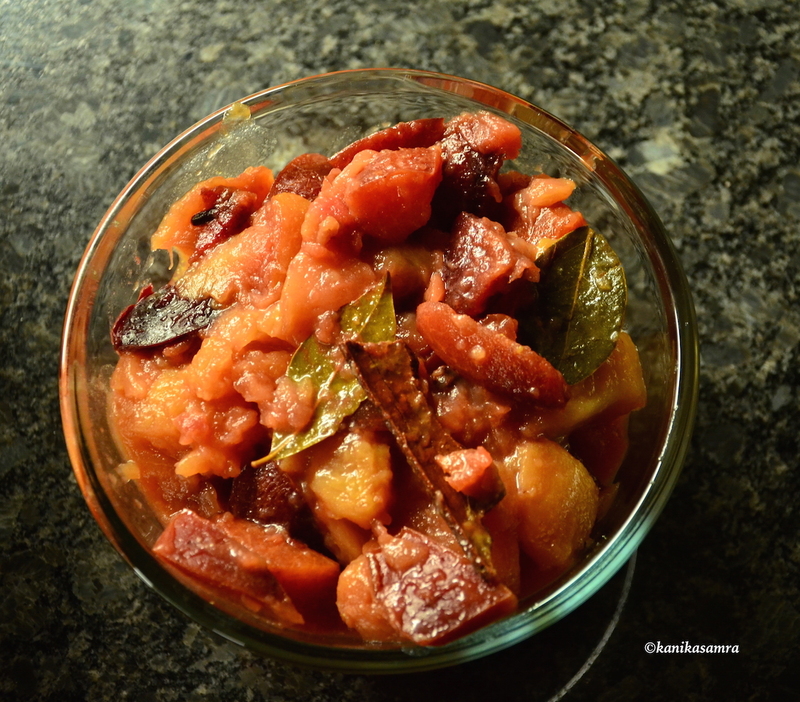 Make use of your fruits by cooking a compote that is easy to pair with pies, cakes, ice creams and pancakes. Collect all your ripe and over ripe fruit and wash it all. Peel apples and slice them into large pieces. Slice open plums and remove the pit. Also take off thin slices of flesh from the center abutting the pit - this tends to be slightly bitter. Put a heavy bottomed pan or deep pot on the stove and warm it on medium high heat. Add a tablespoon of oil or unsalted butter. To this add whole spices- cinnamon, cloves and bay leaves. Saute them for a minute and then add fruit. Brown fruit on medium high for a few minutes. Lower heat and cook covered covered for 10-15 minutes. Allow this to cool and then transfer to a a clean glass container with a lid, preferably air tight. This can keep for a week. Use it as a warm topping with ice creams, cold side with fresh pancakes and waffles or as a filling in pies and crumbles. I chose not to add any sugar or sweetners. Depending on your sweet tooth, you could add a few tablespoons of sugar or honey or agave- any sweetening agent of your choice. We think it will make for a great meal for toddlers too. Wonderful! I like compotes on yogurt!